This quilted wall hanging with cinnamon brown stripes was made by Cindy Grisdela, an art quilter from Reston, Virginia, USA. “Sand Dune” has earthy browns, warmth, and beautifully rendered quilting. “Sand Dune” is a minimalist quilted wall hanging with cinnamon brown stripes and lots of texture in the stitching, including pebbles, waves and echoing ovals that look like wind or clouds. With its warm colors, “Sand Dune” the perfect piece to liven up a small space in your home or office! The quilt is mounted on a 1.5″ deep artist’s canvas that I’ve painted black, so it seems to float on the wall, with a wire on the back for easy hanging. I quilt each piece individually using my domestic home sewing machine and stitching the designs freehand with my needle and thread. One-of-a-kind. Signed by the artist. Use a lint roller lightly to clean. Avoid hanging in direct sunlight. I ship smaller items USPS Priority Mail and wall quilts and larger items UPS within 1 week of payment. If you would like your purchase insured, please let me know as we cannot take responsibility for work lost in transit due to factors beyond our control. Insurance will be charged separately. The quilt will be shipped by Cindy from Reston, Virginia, USA. 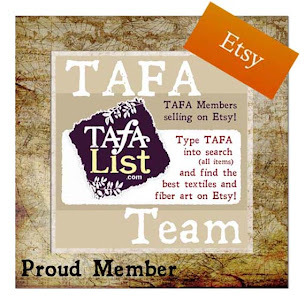 Visit Cindy’s Profile on TAFA.